The world's largest shark fin industry lies in the heart of the Coral Triangle, a region of the Indian and Pacific Oceans home to the world's most diverse coral reefs and known as the Amazon of the seas. This idyllic-sounding environment sustains an industry responsible for the deaths of over 3 million sharks a year. With a reported annual catch of 100,000 tons, Indonesia's shark fishery contributes more to the international shark fin trade than any other nation. Shark fins are tempting targets for fishermen from Indonesian island communities because they have high monetary value and shark fishing is one of the most lucrative livelihoods in these remote coastal regions. The finning industry presents the main livelihood for fishermen in this region and the enormous profits have transformed remote coastal villages to cash-based communities. But in recent years, shark populations have seen a worrying drop in numbers. The staggering increase in the supply of shark fins to a global market has led to overexploitation of these populations and it not only affects the biological ecosystem but also the highly profitable marine tourism industry. To protect both the sharks as well as the local economy, conservationists and scientists are urgently calling for better fisheries management. According to a landmark study, published in the open-access journal Frontiers in Marine Science effective shark conservation in Indonesia only works when shark protection through no-fishing zones is combined with efforts to involve local communities in the management of their own fisheries and by providing alternatives to sustain their livelihoods. To study the effect of No-Take Zones (NTZs) that ban commercial and artisanal fishing of all sharks and reef fish, Vanessa Jaiteh and colleagues went to the Raja Ampat regency of far Eastern Indonesia, the centre of the shark finning industry and where sharks have high monetary value as a tourism attraction. 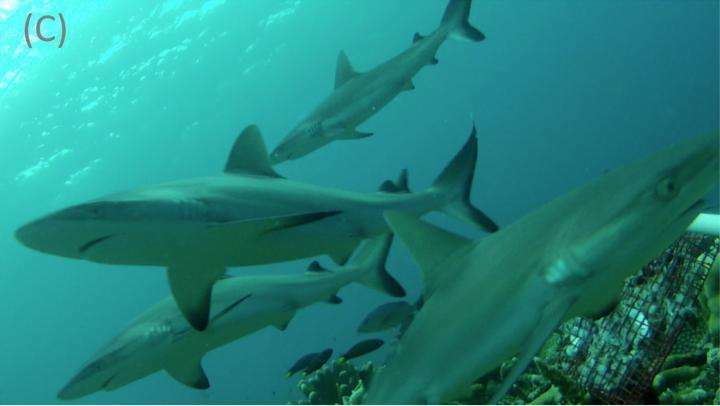 In the two well-enforced NTZs of a Marine Protected Area within a recently established shark sanctuary in Raja Ampat, the number of sharks was shown to be up to 28 times higher compared to areas open to fishing. The scientists propose that this significant difference is most likely due to continued fishing in the open zones while the NTZs are a safe haven for remaining sharks and their offspring by providing more food and refuge. And not only the sharks were shown to thrive in these closed-off areas but other reef fish, too, were also much more abundant. Often, the research stops here, but the scientists set out to also address the socio-economic side. Their aim was to look at the impact of the closure of large stretches of ocean on the responses and behaviour of shark fishers whose main fishing grounds were closed through the establishment of the Raja Ampat shark sanctuary. Of the shark fishers interviewed, all of whom lost access to their primary fishing grounds, 88% knew that sharks were protected in Raja Ampat but many were unsure about the purpose of the sanctuary and few felt their livelihoods were considered by conservation agencies. Talking to the fishermen and running surveys on catch data, the authors revealed that shark fishers adapted to the closures by moving to other fishing grounds, targeting populations in unprotected regions, or by finding other means of supporting their livelihoods, including illegal petrol transport. 'The fishers we interviewed were aware that sharks are important for marine ecosystems and tourism, but also expressed their dilemma in pursuing more sustainable livelihoods within the limitations of geographic remoteness, poverty, and debt with boat owners and traders," Vanessa Jaiteh explained. "Some of their self-initiated alternatives involve high personal or environmental risk and are hardly more sustainable than shark finning, which undermines the broader benefits of locally successful conservation strategies." The findings of this study make it clear that the establishment of no-fishing zones will result in the protection of marine life only if it is embedded within a broader conservation strategy, which includes giving fishers incentives to leave the fishery by providing livelihood options that are legal and sustainable. What do the world's leading shark researchers think of shark conservation policy?